RABs function as a communication tool for naval installations undergoing clean up programs. RABs can be at active military installations and closed or closing military bases (BRACsites). The EPA and DOD document states the RAB's are funded through two mechanisms dependent whether the stie is a BRAC or non-BRAC site. Administrative and logistical support meet the RAB's mission should be provided by the DOD installation using the Defense Environmental Restoration Account at non-BRAC sites and BRAC funds at closing installations. The EPA's website source is http://www.epa.gov/. The U.S. Navy's NAVFAC Environmental Restoration and BRAC websites give more details on RABs. To review the Navy's Document, use the link provided and then select the menu item titled Community Involvement. Technical Reviews can be facilitated through a RABS application for TAPP grants. The TAPP (Technical Assistance for Public Participation) grant funds can be used to purchase third party expertise to evaluate technical reports. The Alameda NAS RAB has begun the process to apply for TAPP funding on a few major sites. Photo of Site 14 Former Fire Fighter Training Site which has a Proposed Plan going forward. 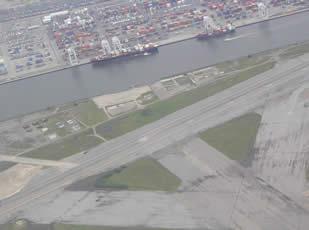 The site is between the Estuary and runway and it is nearly aligned with the cargo ship with the two cranes and the half of the buildings further to the left in this photo. The Navy's recommended remediation plan for Site 14 is in situ chemical oxidation (ISCO) to treat the contaminated groundwater and institutional controls. The ISCO technology has been successfully utilized at other Alameda Point site and this site is not likely to need a TAPP grant.